What is Ruby about? Here you’ll learn more about the philosophy and thinking behind Hello Ruby. 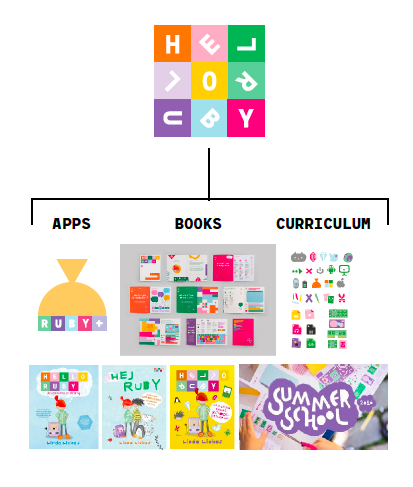 Hello Ruby is the world’s most whimsical way to learn about technology, computing and coding. We are all about curiosity, playfulness and logic. We provide tools for kids, parents and educators to learn to understand programming in a fun and creative way. Our story started off with a book that is now published in over 22 languages, including Japanese, Korean, Dutch and even Finnish. The book made its debut on Kickstarter in 2014 and quickly smashed its $10,000 funding goal after just 3.5 hours and gathering 380 000 dollars in total funding. Hello Ruby was at the time the most funded book on Kickstarter's children's book category. In a more and more technical world we need to make STE(A)M education more approachable, more colourful and more diverse. Our aim is to create, promote and evaluate exceptional educational content on computational thinking for 4 -to 10-year-old children across different channels. These include things like the ability to decompose a problem, spot patterns, think algorithmically, debug problems and work together. Ruby’s story continues online with exercises. We are also working on a series of small apps on computational thinking. Hello Ruby: Adventures in Coding has been published in over 24 languages. The new approach to teach technology has been well received especially in Asia. 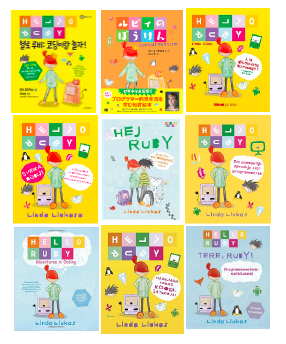 The Japanese edition of Ruby was the most sold children’s book on Amazon and Rakuten for a week and won the biggest design award in China, DIA Design Award. Linda’s TEDx talk in CERN on children and computing has been watched over 1.5 million times. Why we should know code? More importantly, writing software is about expression, creativity - and practical application. Our kids should learn to bend, join, break and combine code in a way it wasn't designed to. Just as they would with crayons and paper or wood and tools. We believe there's plenty to learn in programming logic and culture before showing children a single screen. A 6 minute talk on what is a computer. What if you could fall in love with a computer by falling inside of it?